Will Johnson’s lyrics are the key to Centro-matic. Even with this being true the sonics of the band fight this song by song by trying to obscure the lyrics. The four-piece band consistently comes up with interesting textures for each song and Johnson’s vocal delivery is used differently from song to song as well. The sound is thick and dense most times and that doesn’t create music you are going to fall in love with the first time you hear it. While you could easily label Take Pride In Your Long Odds as not very “accessible” and be completely justified in doing so, this creates positives as well. The songs never wear thin or get boring, the layers of instrumentation stay fresh. The grinding guitars that start out “Academy of Lunkers” always sound sharp in the landscape of the album and the very Neil Young (when he is with Crazy Horse) inspired “Cynthia Glass” struts along with a strong rhythm section. 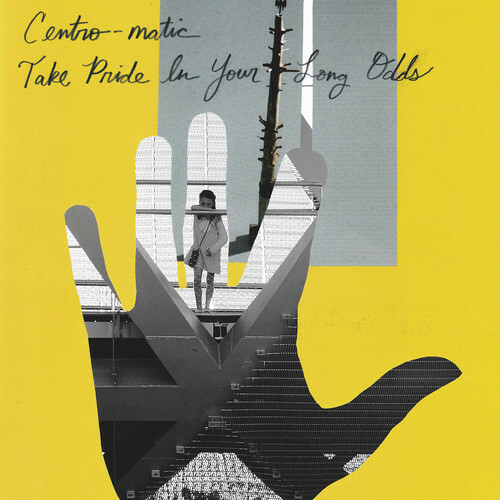 The true take away track here is “Salty Disciple.” The song starts with a strong drumbeat and the guitars kick in to make it one of Centro-matic’s grooviest songs ever. While Take Pride In Your Long Odds may not measure up to its predecessor Candidate Waltz, it still is yet another strong performance from a criminally underrated band. The fact that the band can still kick out records like this this far into their career is impressive in itself. This entry was posted in 250 word album reviews and tagged 250 word album review, 3.5 Stars, album review, Centro-Matic, Centromatic, record review, Will Johnson. Bookmark the permalink.